Lacie Sound2 review | What Hi-Fi? The LaCie name is probably most associated with introducing a touch of sexiness to the humble external hard disk, but in the world of hi-fi it's small beer. That's why it's a stroke of simple genius that the company has partnered with Cabasse, highly respected purveyor of classy loudspeakers, for its latest foray into desktop audio. The result of this collaboration is the Sound2 speakers, which, along with a striking Neil Poulton design, boast a USB connection to a computer, as well as a line-in for a portable music player. Whether or not you're keen on the styling, the build quality is undoubtedly impressive for the money, and little touches like the firm volume-wheel on the back increase the feeling that this is a properly thought-out product. The moment you play some music through the Sound2s, that feeling is absolutely confirmed. In combination, the built-in class-D amplifier and 70mm drivers produce a sound that's spacious, clear and detailed. Play Wild Beasts' All the King's Men, and the drum opening is reproduced with punchy gusto. Vocals are brilliantly clear throughout, and the whole presentation gels in a balanced style that's impossible to dislike. If we were to nit-pick we'd point out that the small drivers aren't able to reach the lowest lows or highest highs, but they also avoid any harshness in the treble and are free of blowiness in the bass – for a product of this type and at this price, that's a mighty achievement in itself. It can be hard to get excited about ultra-affordable computer speakers, but these LaCies have proven a very pleasant surprise. 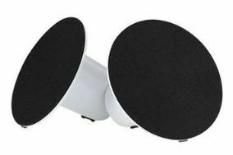 If you're still making do with your laptop's built-in speakers, you should buy a pair of these.